His longtime manager, Charles Watson, said it may have been that competitive spirit that led Forrest to chase a wallet snatcher Saturday night in Atlanta, a pursuit that ultimately ended in Forrest's death. "He got caught up in that competitiveness and chased the guy," Watson said. "Sometimes your strengths turn out to be your Achilles heel." Forrest's resolve permeated his training, McGirt said. Even when Forrest was in a bad mood -- a common occurrence among fighters trying to make weight -- he gave 100 percent. Sometimes, McGirt said, he would need to make Forrest laugh, a fairly easy task, before the two could start drills. 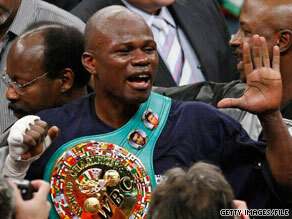 His second win over Mosley would earn him the Boxing Writers's Association of America's 2002 "Fighter of the Year" honor. But rather than prance around the ring spouting braggadocio after his unanimous decision, he rushed into the stands to embrace the youngsters, who called him Uncle Vernon, Watson said. "Vernon was the type of guy - he was his own man," McGirt said. "He told you what he really felt. He didn't pull any punches. That's what I loved about him."